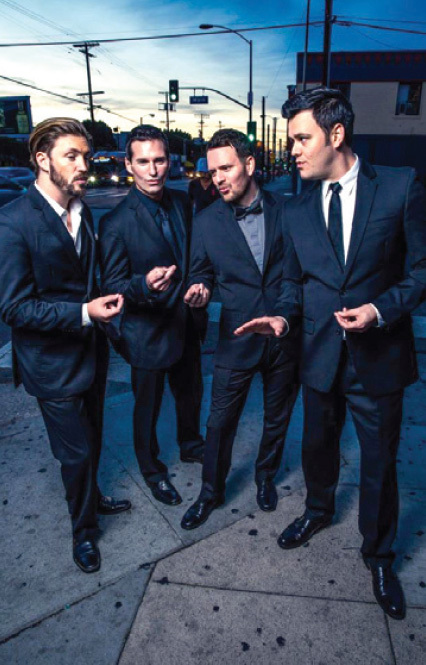 The Modern Gentlemen – These 4 amazing voices have been all the background vocals and choreography for the last decade alongside rock and roll icon, Frankie Valli. Their own signature sound blends modern voices together in four part, harmonic perfection with high energy & tight dance moves performing the classic hits of Motown, Pop, Rock Doo-Wop and of course, The Four Seasons! The Modern Gentlemen have toured the world performing on the biggest stages from Royal Albert Hall with the London Symphony Orchestra, to Broadway, Asia, Canada, Australia and New Zealand. They’ve appeared onstage with The Beach Boys, The Manhattan Transfer, Tony Bennett, Smokey Robinson and other greats, for presidents of The United States and Prince William! Not a tribute, but the real thing!